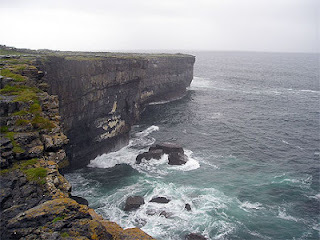 I visited the Aran Islands in 2005 and found myself at a place beyond my imagination. 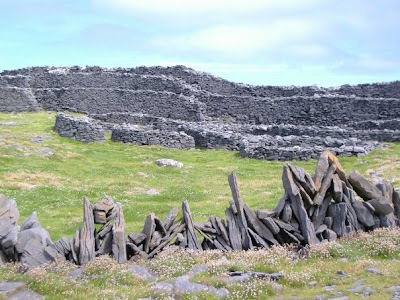 Housed on the edge of a cliff (hundreds of feet above the ocean) on the island of Inishmore was a stone fort aging back to the Iron Age—Dún Dúchathair (The Black Fort). 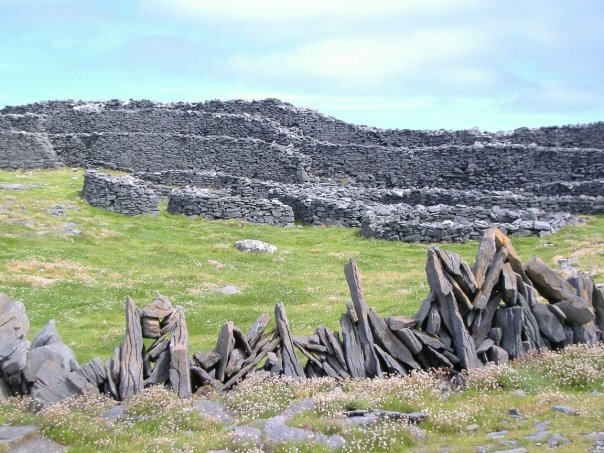 The stones of these forts have no mortar; they're just standing on their own without any ropes or fences. When I visited this fort, early one morning, a dog was roaming around, sniffing the rocks, and when I ventured a little closer to the edge of the cliff than he liked, he made his way in front of me. A misty morning, looking out over the sea, I couldn't help but think he wanted to make sure I was safe. He even remained with me until I was safely away from the edge. My own guardian dog. This poem tells the story of how a druid, while conjuring up spirits from ages past, opens a door that allows not only ancient Celtic warriors—Cuchulainn and Aoife—but also Greek ones—Achilles and Penthesilea. Their meeting proves to be one untold by ancient sages. The poem mentions Celtic warriors, like Scáthach (scou'-ha, or skah'-thakh), who trained Cuchulainn (koo-hoo'lin), as well as weapons, like Gae Bulga, Cuchulainn's spear, and Cruaiden Cadatchenn, his sword. Additionally, the Sidhe (fairy folk) make an appearance. The only playthings of the Sidhe. Ever-vigilant, protecting an age forlorn. Death knows life, the veil is down. Iron fists gripping notched spear and blade. A Celtic hero breathes again. And no Cerberus to thwart passage. Confronts his reflection in Fate’s mirror. Swords lowered, yet eyes remain. Who bested her in battle. Her Styx-dipped nemesis and lover. Cruiaden Cadatchenn and Amazon broadsword. What once was hers—Gae Bulga! A captured audience, but mute. Entertaining Ursa Major and Orion. Incite the dancers to fury. Each tossing arms to the ground. The druid left to wonder.